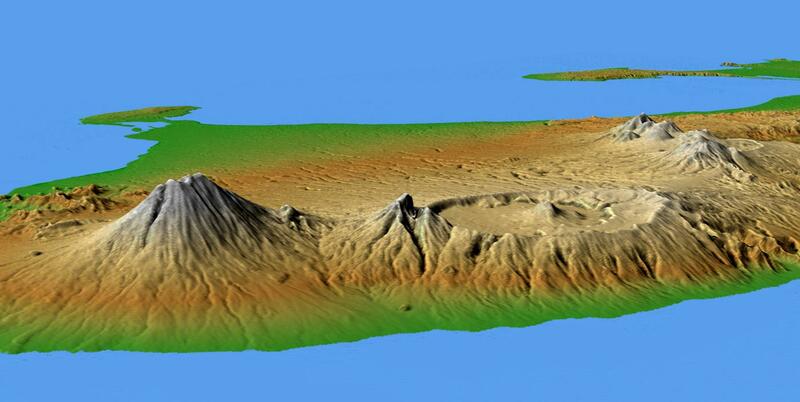 SRTM obtained elevation data on a near-global scale to generate the most complete high-resolution digital topographic database of Earth. USA (NASA) collaboration with Department of Defense's National Imagery and Mapping Agency (NIMA), the German Aerospace Center (DLR) and Italian Space Agency (ASI). C-Band and X-Band are in the microwave portion of the electromagnetic spectrum. Two bands (C-Band and X-Band) used to generate DEMs (Digital Elevation Maps). Data points spaced every 1 arcsecond of latitude and longitude (approximately 30m). The 30m spatial resolution matches that of most Landsat images and the Landsat image can be draped over the DEM (Digital Elevation Map) created from the SRTM radar data allowing for true-color (or infrared) 3D data visualization of the Earth's surface. 30m resolution data is publicly available for the United States. The rest of the world will have 90m resolution, but 30m resolution can be requested on a case-by-case basis. Because the SRTM mission lasted only 11 days, most areas were mapped only one or twice. Shuttle launched from and landed at Kennedy Space Center in Florida. Each CD-ROM can hold 600 MB. 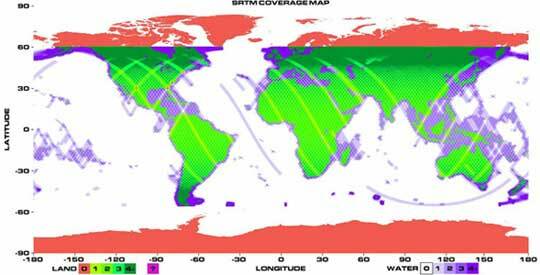 C-band North America and South America datasets are available to the public. The complete C-band public data set will be available in mid-2004. C-Band data can be downloaded for free or purchased on CD-ROM (see #16). Data formats available: ArcGrid, BIL (integer data), and TIFF (32 bit floating point grid).